Some of the participants in ‘Jura Lives’. 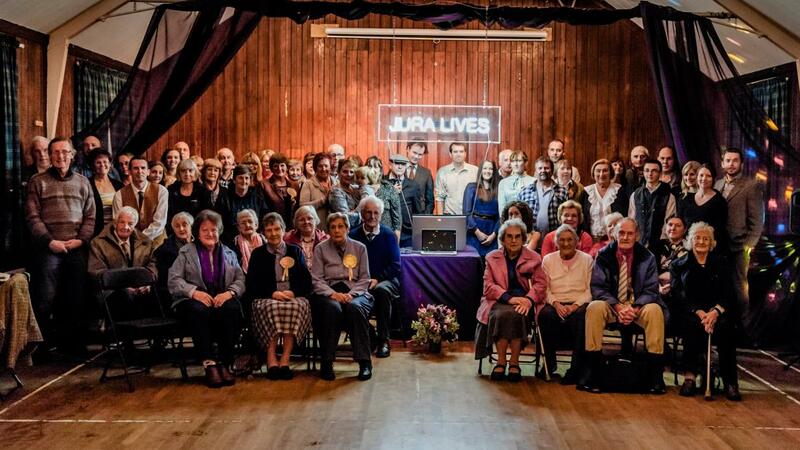 The Isle of Jura – with a population of about 200 – has been named ‘Community Archive and Heritage Group of the Year’ for its oral history project ‘Jura Lives’, which interviewed people about their memories of the island’s unique way of life and created a new sound archive. The award was announced at the annual conference of the Community Archives and Heritage Group at University College London on 12 June. It will be formally presented to those who worked on the project – on Jura – on 26 June. ‘Jura Lives’, a 2-year Oral History project run by the Jura Development Trust, aimed to collect and preserve the remote island’s heritage and enable easy access to it,using the most modern digital recording equipment and computer-power. Along the way, focus was on strengthening community confidence and providing learning opportunities based on a shared heritage. The island’s tiny community now has a searchable, digital catalogue of audio and metadata for nearly 1,000 records from more than 180 sources. A souvenir CD called ‘A Landscape of Lives’ of 30 selected stories from the catalogue has been produced. While the project initially targeted the residents and visiting community of Jura, others from the wider Jura diaspora were also welcomed and recorded. ‘From landowners to crofters, from shopkeepers to artists to groups of school friends, from those who live on the island now to those who knew it from the 1930s and all decades since… their stories are now preserved in their own voices and own words for all time,’ says Jane Carswell, who led the project. Project organisers worked with Jura’s primary school to source contributions to the sound archive from everyone in the crofting community. Pupils invited islanders to come to a weekly café in the school (with its own neon sign!) and be interviewed. The project was made possible through funding from the Heritage Lottery Fund, the Jura Development Trust and the Argyll and Islands LEADER programme. Funding for a second phase of the project is now being sought, in order to explore practical applications for the newly collected material. The 2014 CAHG judges were deeply impressed by the way the project had brought together different generations ‘to bond over their shared heritage’ and the range of activities undertaken. The emotional impact of the work of Jura had been profound. ‘This project definitely has the potential to inspire others, particularly in small, isolated communities’ they said. A cash prize for the Community Archive and Heritage Group of the Year is given by Sticks Research Agency. This page was last updated on 17 May 2017.